it will be easier to take one of the current examples e.g. TestPage2PDF.vbs and modify it to meet your requirements. You will basically need to replace the "print a testpage" part with "print the html file specified by my input". I shared my printer so now it is available at \Arthur-P52s\PdfCreator. Then I used the WScript "print" command to replace the command that prints a Windows test page - see code below. When I run the script I get this error on line 45. "printJob.ConvertTo(fullPath)"
If I run "print /d:\Arthur-P52s\PDFCreator C:\Users\arthur\Desktop\test.txt" from command promt it opens a save dialog. 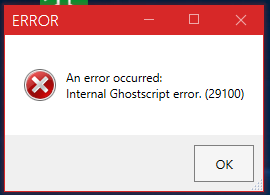 When I click save it gives me a ghostscript error. Any help is appreciated. 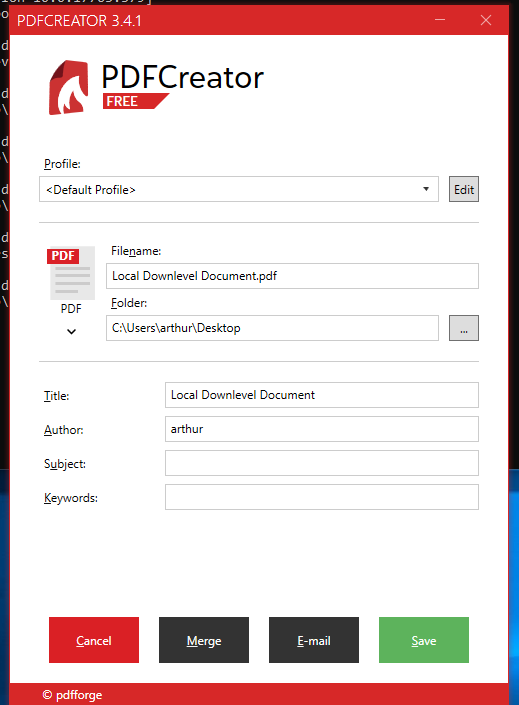 ShellObj.Run "print /d:\Arthur-P52s\PDFCreator C:\Users\arthur\Desktop\test.txt" seems to be working as expected, as it seems to print the file to the PDFCreator printer, triggering the PrintJobWindow. To find out why you are getting the Ghostscript error after pressing save, please check the log inside %localappdata%\PDFCreator (you can increase the logging detail by setting the log level to "debug" or "trace" in the PDFCreator application settings. Do you not get the error if you manually print the same document to PDFCreator? If the script is only used for converting, you don't really need the COM interface, you can also call PDFCreator from a command line. Thanks for the reply. If I right click the file and print it to PDFCreator it prints just fine. 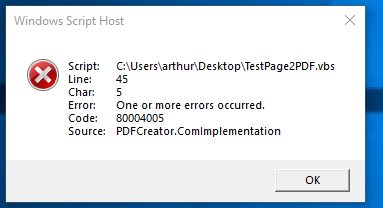 here is the log file after running "print /d:\Arthur-P52s\PDFCreator C:\Users\arthur\Desktop\test.txt" in cmd one time. 2019-04-09 12:24:44.2912 [Warn] pdfforge.PDFCreator.Core.Workflow.PageNumberCalculator.NumberOfPagesFromSourceFiles: Problem detecting number of pages from source file(s). Set to 1. 2019-04-09 12:24:46.0381 [Debug] pdfforge.PDFCreator.Conversion.Ghostscript.OutputDevices.OutputDevice.GetGhostScriptParameters: Created metadata file "C:\Users\arthur\AppData\Local\Temp\PDFCRE~1\Temp\JOB_ZE~1\metadata.mtd"
2019-04-09 12:24:48.0516 [Error] pdfforge.PDFCreator.Core.Workflow.JobInfoQueueManager.ProcessJob: The job 'Local Downlevel Document' terminated at step Error and did not end successfully.